Richard Mille just announced the RM 011 Automatic Flyback Chronograph Black Phantom, a new limited edition of its flagship model. 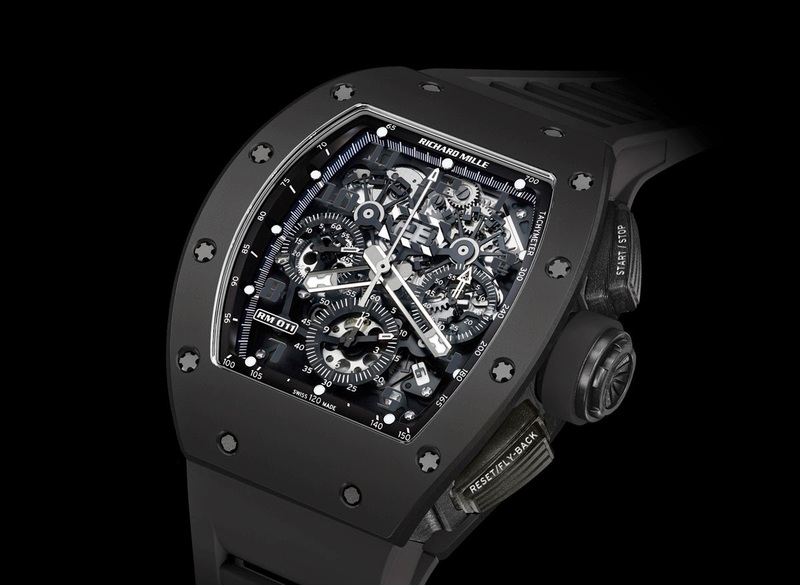 For the case of the Black Phantom Richard Mille adopted two high-tech materials in the deepest shade of black. The caseband is made of NTPT (North Thin Ply Technology) carbon, an exceptionally strong and light material composed of multiple layers of parallel filaments obtained by dividing carbon fibers. After impregnating these layers with resin, they are woven on a special machine that modifies the direction of the weft, creating a visual effect similar to the texture of wood. NTPT is here used also for the crown and the pushers. 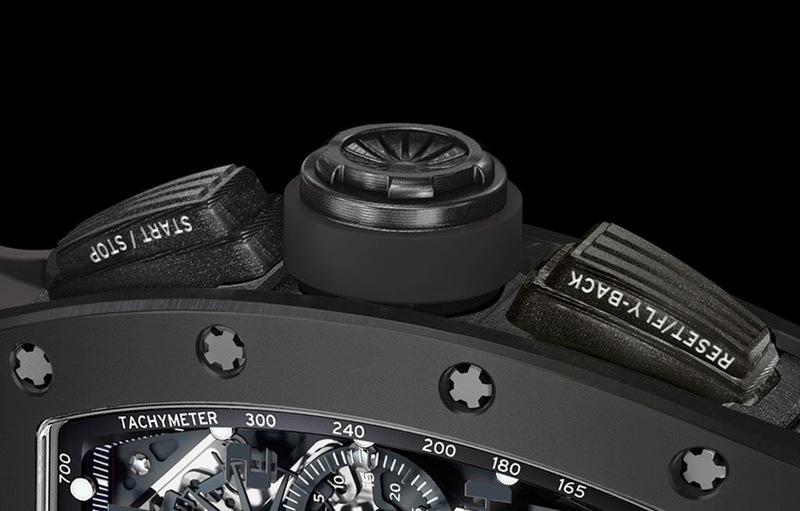 For the front and the back bezels of the Black Phantom's case, Richard Mille chose black TZP (Tetragonal Zirconia Polycrystal) ceramic with a matte finish for its resistance to scratches and corrosion. 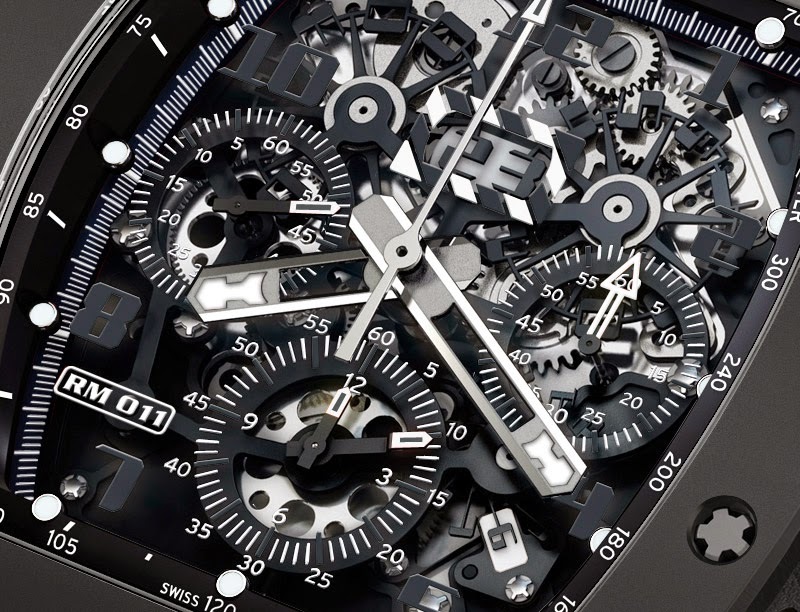 RM 011’s main features include a skeletonized automatic winding movement with variable rotor geometry and 55 hours of power reserve, a flyback chronograph with 60-minute countdown timer and 12-hour totalizer, month display between 4 and 5 o’clock, oversize date display at 12 o’clock, annual calendar. Case size is 50.00 mm x 40.00 mm x 16.15 mm and offers water resistance to 50 metros. 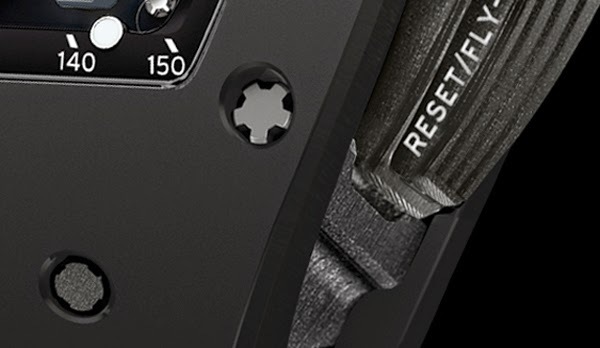 The Black Phantom is matched to a black rubber strap with black DLC titanium buckle. The Richard Mille RM 011 Automatic Flyback Chronograph Black Phantom is a 50-piece limited edition available in North and South America. The retail price is US$ 160,000. 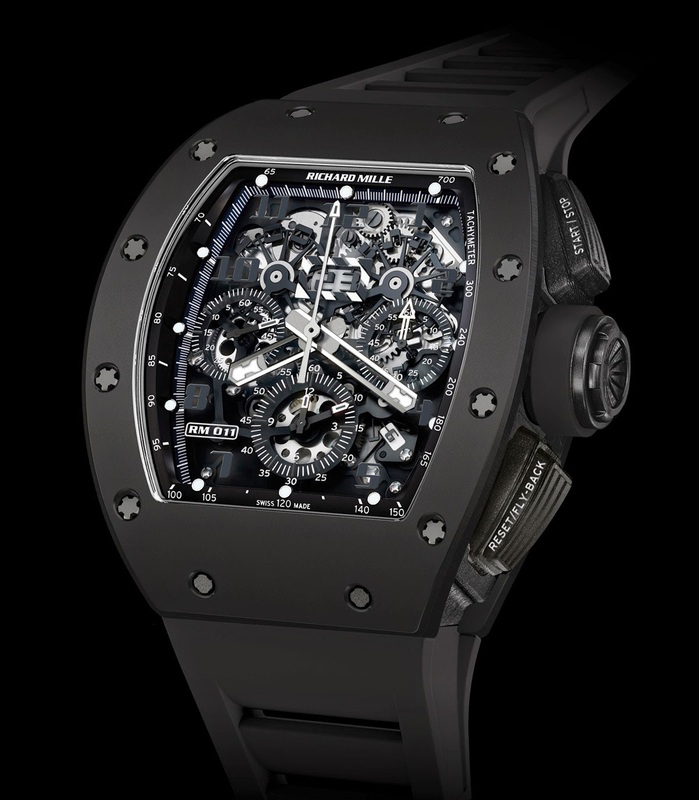 Richard Mille RM 011 Automatic Flyback Chronograph Black Phantom. Richard Mille just announced the RM 011 Automatic Flyback Chronograph Black Phantom, a new limited edition of its flagship model. 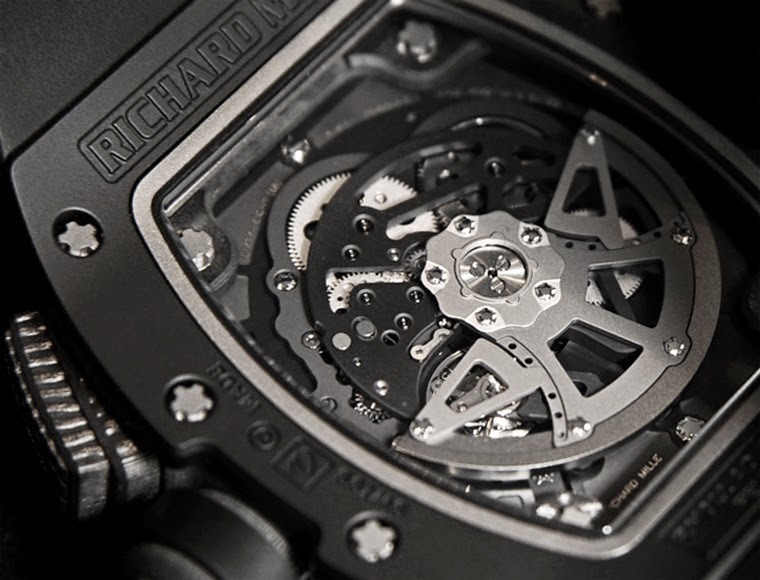 For the case of the Black Phantom, Richard Mille adopted two high-tech materials in the deepest shade of black: NTPT carbon and TZP ceramic. The Richard Mille RM 011 Automatic Flyback Chronograph Black Phantom is a 50-piece limited edition available in North and South America. The retail price is US$ 160,000.